Gertrude Bentley Cooke was born on 23 September 1887 at 8 Lime Tree Avenue, Tillington, Stafford, the daughter and only child of Emma and Albert James Cook, both of whom were employed in the manufacture of shoes. Her middle name of Bentley seems to have come from Clara Bentley who was a witness at the wedding of Gertrude's parents and may have been a friend of her mother. Gertrude's father died in 1889 when she was less than two years old. The census of 1891 shows her with her mother living with her mother's parents at 30a North Street in Stafford. In 1891 Gertrude's mother Emma married Alfred Dexter, leaving Gertrude in the care of her sister, Gertrude's aunt Ada Thomas. Ada married William Parker and went to live at 4 Hallam Terrace in Budbrooke, taking Gertrude with her. She was still living with them when the census of 1901 was taken. Her mother emigrated to Canada with her new family in 1909. At some stage Gertrude moved down to London and the census of 1911 shows her as living at 5 Crown Terrace in Cricklewood, Middlesex and porking as a Shop Assistant. However, the census also showed that she had changed her name to Vera Gweeseni Cook, and, more than that, had described herself as a USA citizen resident in England. She may have changed her name to break the ties with her background. The complexity of her position within her family group is illustrated on an accompanying chart. Since Gertrude adopted the new name of Vera, that is how she was known, and that is how she will be referred to from hereon in this biography. 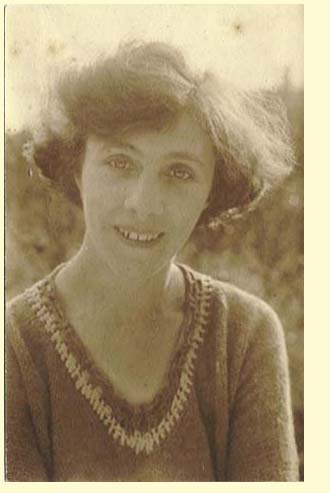 She was still living at 5 Crown Terrace, Cricklewood at the time of her marriage to Sydney Folker on 16 December 1911, after which they lived at number 12. On Vera's marriage certificate, her fathers name is given as Eldred Vernon Cook and his profession as a draughtsman but neither of these were correct. They would appear to have been dramatised by Vera for reasons of appearance, similar to the change of her own name. Vera has also added the name Dexter to her surname on the marriage certificate, that being the name of her step-father. Vera had a nice picture taken of herself around the time of her marriage. She liked performing in amateur dramatics and there are some pictures of her in costume. She used to take part in amateur productions with Sydney at Brentham theatre and leisure complex which formed part of the estate on which they lived at Fowlers Walk and it is likely that it was through this interest that she had originally met him. Fred Perry, the tennis star, was trained at the tennis courts at that leisure complex by his brother-in-law whose name was Sainsbury. Vera and Sydney's daughter, Dora Emily, was born at Crown Terrace on 3 September 1913. She was known from the outset as Doady which was a name taken from a Charles Dickens character. Because her mother helped her father in his shop, Doady would stay with her grandmother and was effectively brought up by her. Vera did declare the fact that she had changed her name from Gertrude to Gwseeni, and told her daughter she had added the name Vera. She said she had been named after an aunt Gertrude but that she changed her name because she did not like it. The family moved to a new house at 103 Fowlers Walk in Brentham in about 1915. Vera worked as a bookeeper for the shoe retailing company Freeman, Hardy and Willis. At one time she worked for them in Madrid where they dealt in Spanish leather. 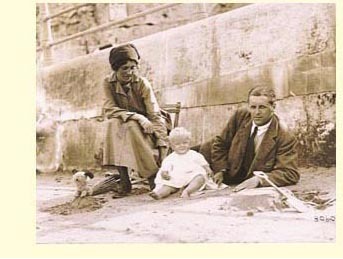 When Sydney was making his films, Vera would go along to watch, taking their daughter Doady with her. One of the locations was at Syon Park in Isleworth. Like Sydney, Vera was a keen on golf and was a good player. There was a course at Greystoke Manor close to their house. Her set of clubs in a monogrammed bag and that belonging to Sydney were passed down to her grandson Malcolm who used them himself on a number of occasions. Both Sydney and Vera much enjoyed the outdoor life and spent a good deal of their time camping. The used to go to Climping during their early years where they stayed in tents or caravans. In about 1928 the family moved to 80 Gresham Road in Osterley. Sydney called the house "Tappee", afer a fertility symbol brought back from overseas by his ancestor, Samuel Folker. The tappee was very obviously a fertility symbol which offended Vera so she made a leather apron to cover it up. However, it was eventually given to Kelvingrove Museum in Glasgow who specialise in such artefacts. As mentioned earlier, Vera used to assist Sydney at his china and glass showrooms in Holborn, London. She became expert in Belgian glass. The 1939 register shows them still living in Gresham Road, Osterley. In 1941, Sydney and Vera moved to Marlow in Buckinghamshire where Sydney built a house called "Dingley Dell". Initially they lived in their caravan, then in a chalet that Sydney built and which was properly fitted out. Vera took an active part in their plan of being self-sufficient and worked hard on the land and also in making home made jams and preserves from their own produce. Her particular interest was the goats and she had two maiden milker pedigrees called Venus and Ariadne. There was also a grumpy billy-goat called Billy that butted the wire netting around its pen so that all the wire bowed outwards. Sydney and Vera had neighbours who lived at White Hill Cottage close to "Dingley Dell". They were Swiss and called Christian and Catherine Bernet. By co-incidence, Catherine had been a neighbour at Crown Terrace in Cricklewood all those years ago. Vera died at the Royal Berkshire Hospital on 15 April 1949 and was cremated at All Saints crematorium, St.John's, Woking, which is the oldest such establishment in the country. Sydney joined her in 1955. She did not leave a Will, but Letters of Administration were issued on 10 June 1949.